For kids and their families there’s nothing like hearing great live music! That’s why, in addition to the Festival’s lively off-season musical offerings for students in greater Santa Fe area schools, during the summer season we present four interactive, fun Youth Concerts that never fail to entertain and inspire our youngest audiences, building their knowledge and curiosity about the world of music. These concerts provide a variety of experiences, with Festival artists engaging children (and their accompanying adults!) through fascinating storytelling about music, musical instruments and styles, composers—even a bit of history—and, of course, performing the same high quality music as on the regular concerts. Though there are the occasional Disney tunes (played in arrangements for the particular participating musicians) Youth Concert repertoire is drawn directly from the Festival’s scheduled programming. Naturally there are complex logistical considerations with such an ambitious program. Youth Concerts must be scheduled to dovetail with regular Festival performances. Artistic Administrator/ Production Director Linda Klosky reviews musicians’ rehearsal schedules and availabilities, after which Deborah Leah Ungar, the Director of Education and Outreach and Artistic Director Marc Neikrug make the final decisions about the Youth Concerts’ schedule, performers, and repertoire. The number of musicians on any given Youth Concert can range from a solo pianist to a woodwind trio to a six-member percussion ensemble. And there might be some unusual “guest performers,” too, from a straightforward (but by no means dull!) narrator to a costumed frog to jugglers to an interloping horn blasting away while a string quartet is in progress. Occasionally even someone from the audience might be asked to participate. Youth Concerts got their start in 1983, “as a public service to the community and in order to involve future audiences in the joy of music,” the Festival program book proclaimed. There were six Youth Concerts that season, held on Saturday mornings. Among the other musicians who have performed in Youth Concerts are the Orion String Quartet, the Imani Winds, Real Quiet, the Miró Quartet, members of The Santa Fe Opera brass section, OPUS ONE, Tiempo Libre, the Johannes String Quartet, Wu Man & Friends, and many more. While the types of ensembles have varied over the years, the selection is always done with an eye and ear to artists who love kids and enjoy sharing their musical passion with them. 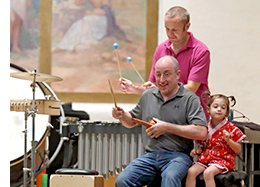 “Musicians love performing for young children, and the YCs give them a chance to relax and share some of the ‘inner workings’ of chamber music. Moreover, many of the musicians have small children themselves and so have lots of personal experiences with talking about music,” says Festival Executive Director Steven Ovitsky. Deborah collaborates with school music programs, enrichment classes, and day camps to spread the word about YCs. Consequently, the audience is comprised, for example, of school children who are bused to concerts, Santa Fe area residents or visitors to the city, and often sons and daughters of musicians who play at The Santa Fe Opera. Deborah summarizes her enthusiasm about Youth Concerts, saying, “I love how they provide a welcome chance for families to spend time in the beautiful St. Francis Auditorium enjoying high quality music together and stimulating children’s imaginations about how they might try to play an instrument one day themselves. Parents have recounted stories of how their children demonstrate the impact of these experiences by reenacting the games, performances, and stories the musicians have presented. One parent shared with me that his daughter pretended to play the cello for weeks after the concert, singing along with her imaginary instrument. What a wonderful thing it is that our YCs create such opportunities!” Click here for the Youth Concerts Schedule. Read Part 3 of our Education series with information about Strings in Our Schools. In case you missed Part 1, Music in Our Schools, click here to read it now.